Over 2000 years ago, on the south bank of the river Krishna stood the Mahastupa, the largest stupa in the country. 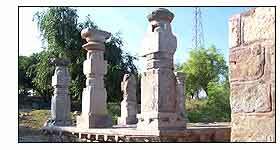 The history of Buddhism, Andhra Pradesh took leading role in the spread of Buddhism to Far Eastern countries. The state has over 140 listed Buddhist sites, which provide a panoramic view of the history of Buddhism from 3rd century B.C. to 14th century A.D. Proceed for full day city tour visiting the Alukuma Palace, Salar Jung Museum and Charminar. Afternoon visit Anandha Vihara the Majestic modern Temple dedicated to Lord Buddha & opened by Dalai Lama himself and the Grand Monolith Statue of Lord Buddha at Buddha Purnima. Overnight at hotel. Drive to Nagarjunasagar (155 kms / 3 hrs) and check into hotel. Proceed for sightseeing of Anupu ruins, the Amphi-Theatre, Viharas & Chaityas and the other impressive Buddhist remains. Overnight at Nagarjunakonda. After breakfast take a boat excursion to visit the serene Nagarjuna Konda Island Museum. One of the outstanding Buddhist civilization dating back to the 3rd century AD were excavated here and are carefully preserved on a picturesque island called Nagarjuna Konda, situated in the centre of a man-made lake. Evening return to Nagarjuna Sagar. Overnight at hotel. After breakfast, take a full-day guided tour of Bhattiprolu and Ghantasala Buddhist stupas, Neelamkondapalli & Jagayapeta stupas filled with inscriptions from the Mauryan era and the beautiful Undavalli Caves. Overnight at hotel.